Stability has returned which bodes well for the future of the property market with moderate price increases for lower priced properties and zero inflation for higher priced property. There were 99 residential property sales recorded in the Clonakilty region up from 81 in 2017. The average price paid for a dwelling in the greater Clonakilty area averaged €225000 which is up 10% on last year. 36% of our sales went to investors and holiday home purchasers. 11% of purchasers were trading up to a more expensive property and 17% were trading down to a smaller dwelling. First time buyers accounted for 36% of our sales. Nationally 42% of property sales last year were mortgage free. Last year saw the return of the UK buyer albeit at lower price levels, which reflects the change in the currency strength of the pound. There were many expat buyers too from the US, Middle East and Australia/NZ. The Clonakilty area is seen as an attractive investment location given the proximity to Cork City and Airport, several beaches and the general quality of living there can be had in this area. Where property is competitively priced to reflect market conditions there is generally no issue getting these to sale agreed. Even a slightly over priced property however is struggling to get viewings. For properties that have sold the average time on the market is 3 months and the average time then between sale agreed to closing is 3-4 months. There are 35 properties currently advertised for sale within a 10 minute drive to Clonakilty. 50% of properties in Clonakilty are owner occupied and 73% of rural property is. The balance are mainly rentals, holiday homes or vacant property. The most expensive home sold in the area last year was the beautifully sited Island Road property in Youghals (Inchydoney road) at E630,000. There is further tightening of availability in the rental market. The average detached house coming up for rent is approx. E825 with 2 bedroom apartments E650 pcm. Even though there is a huge shortage of rental property a whopping 10% of all houses are vacant in the area and this does not include holiday homes. 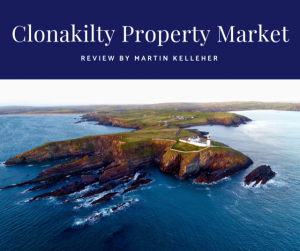 Looking to the future of the Clonakilty property market there are 3 large private residential projects in the planning stages which, if successful, should provide for 220 new builds. Added to the planned county council developments, on Western Road and Fernhill Road, this figure could rise to 300 new builds in the area over the coming few years.